With the custom setup of Clarence continuing (nearly done), I wanted a Brooks saddle & decided that a Brompton dealer visit was necessary to help decide which saddle would suit. When I returned from a UK trip last year, I had discovered that Sydney (& Australia) now have many more Brompton dealers than I’d thought & so I set out to visit the 5 in Sydney. Unfortunately I never actually finished my task but the one that stood out was “Belrose Bicycles”, who had stock of 12-15 Bromptons & many accessories & spares. This was quite a revelation in comparison to the past, when a few seen in Sydney would represent a lot. So it was that my latest shopping trip started with Belrose & yes, I was able to decide on my purchase from a very good range of Brooks saddles. For a non-Brompton accessory I wanted I was out of luck & once home again, I decided to phone around to various likely bike shops for what I wanted. “Out of stock” or “not that model” was a common response & so I turned to an Internet search of local shops as a last resort to an Internet order. This time my phone enquiry returned a positive response but on reviewing the shop’s website I was surprised to see that they also were “Brompton stockists”!? Apparently a very new addition according to the website & from my check, not even showing up yet on Brompton’s Dealer Listings? I just had to go for a visit to this “Omafiets Dutch Bicycles” shop! Omafiets are located at Redfern, right along a bike path & pretty close to Redfern & Central train stations. On arriving there on Ralph. I found a fairly tiny shop that was part showroom & part workshop? Hardly what I was expecting but it was readily explained by their very recent move to Redfern & everything still being setup? 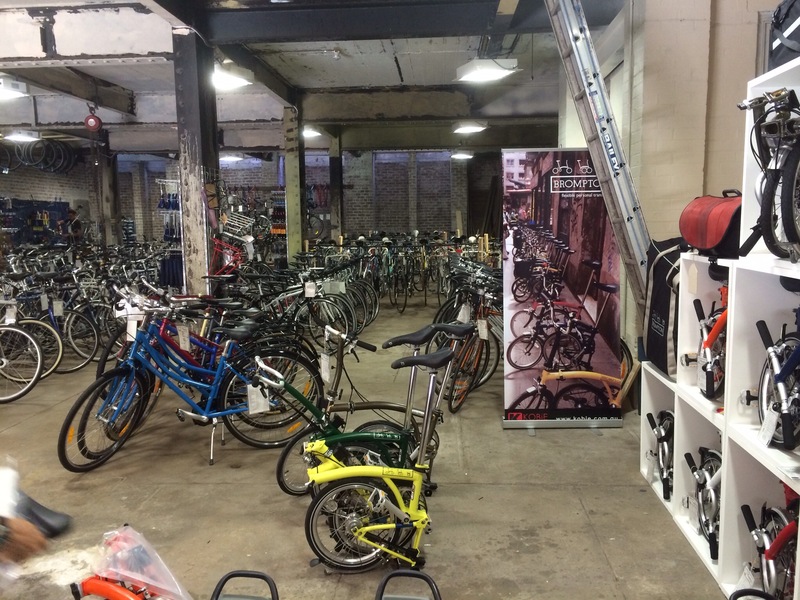 I was then taken out of the shop & down a lane next door, into one of those gigantic “old Sydney” warehouses containing countless bikes – with a nice spot to one side for the Bromptons! 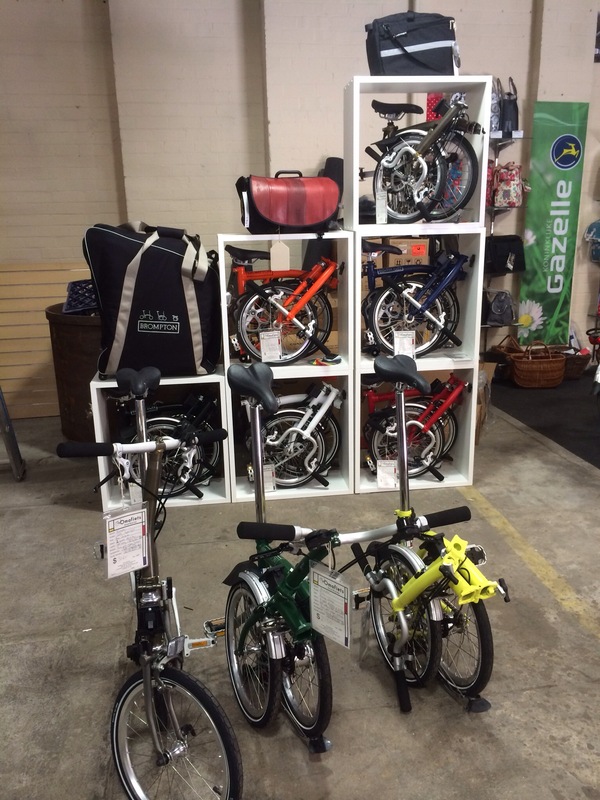 Once again, all very new & while the Bromptons were on display, the accessories & spares were still being unboxed. My 2 pics below only cover a small section of the shop. After lots of discussions & wonderful efforts from the staff to come up with the pieces I wanted, it was time to depart. Back onto Ralph & a short ride (via a cafe lunch stop) to Newtown for a visit to another Brompton dealer: “Cheeky Transport”. No stock of an additional non-Brompton accessory I was looking out for, but what I did see was another 10-12 Brompton bikes! From 5 Brompton shops that I’ve seen in the past 2 weeks, they probably have about 40 bikes on display!? So very different to a Sydney not so long ago? Did you get the saddle that you wanted?